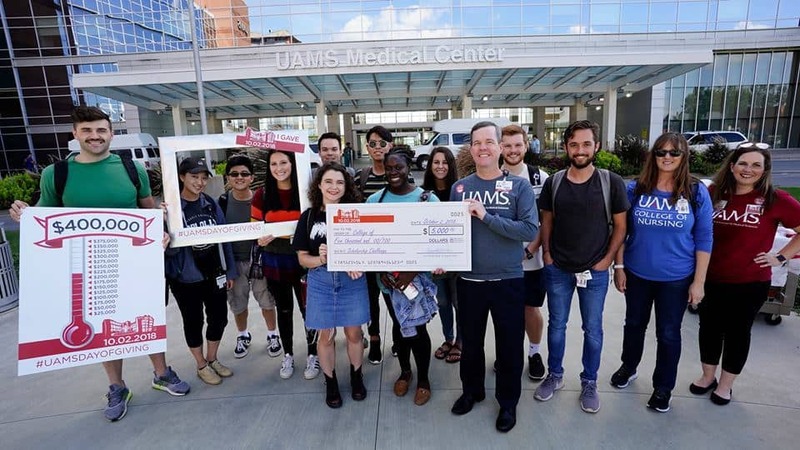 UAMS Chancellor Cam Patterson, M.D., MBA, (center right, holding check) poses for a photo with students and organizers of the 2018 Day of Giving during the afternoon on Oct. 2, when the philanthropic campaign to raise funds for UAMS was ongoing when the campaign had not yet reached its $400,000 goal. The drive brought in more than $500,000. 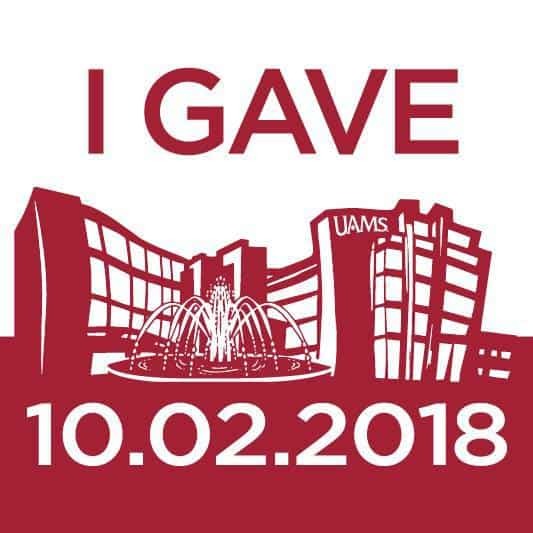 Oct. 4, 2018 | Over a 24-hour period beginning early Oct. 2 and ending in the wee hours of Oct. 3, the foundation for UAMS received more than $500,000 for the state’s only health sciences university in response to the second annual UAMS Day of Giving fundraising campaign. Donations were still being counted when the total hit $518,000. Patterson and his wife, Kristine, transport patients to clinics during the Day of Giving. Patterson kicked off the day’s events by making its first official donation at 6 a.m., Oct. 2. 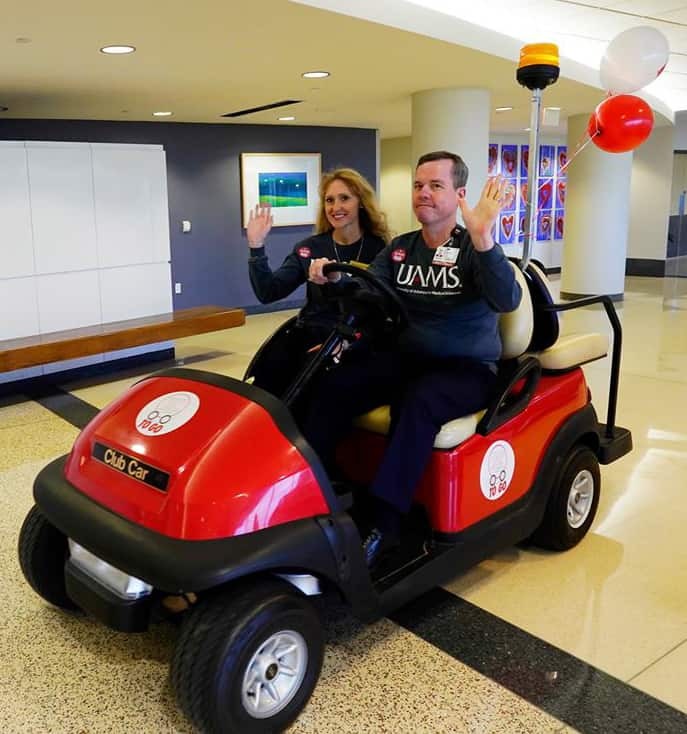 He and his wife, Kristine B. Patterson, M.D., helped with many activities throughout the day, with one of the most popular events at the UAMS fountain taking selfies with the students. The campaign, in its second year, surpassed its stated goal of $400,000 before 5 p.m., said Amanda May, director of annual giving. Donors made gifts via phone or online at the campaign website, dayofgiving.uams.edu. UAMS leadership and volunteers staffed tables around campus to receive in-person donations from anyone wishing to give to support their area of interest, including employees passing by on a morning walk or during their lunch hour and families grateful to UAMS for the physicians, nurses and other health care professionals who provide patient care to their loved ones. Donation stations dotted the campus as part of the Day of Giving. Some offered free slices of cake and other goodies, and campus leadership also assisted at Doc Java and at the information desks. All money raised will support the various programs, colleges or institutes chosen by the donors, and the donors’ gift designations were spread across areas of patient care, education and research. Social media was abuzz with photos and videos from patients, families, employees and supporters using the hashtag #UAMSDayofGiving. They shared stories about the difference UAMS made for them, and why supporting the institution helps those in need tomorrow. UAMS Northwest Regional Campus kicked off the day with a “Thanks a Latte: Onyx Coffee Bar & Breakfast” event in the Epley Lobby of its building in Fayetteville, inviting community members to stop by for coffee and make a gift. UAMS has more than 1 million patient visits each year. Those patients are seen by UAMS faculty at its main campus, regional campuses, the Central Arkansas Veterans Healthcare System, Baptist Health and Arkansas Children’s Hospital. UAMS graduates nearly 1,000 doctors, nurses, pharmacists and other medical professionals each year, the majority of whom stay in Arkansas to practice. It’s a difference felt across the state. “The Day of Giving also raises awareness of the importance of UAMS to our state, as well as the fact that UAMS is a destination for philanthropy from our alumni, grateful patients and families, and others who are touched by the life-changing services UAMS provides,” said May. UAMS relies in large part on its own revenue to support itself, but often that isn’t enough. State appropriations are only about 6 percent of UAMS’ $1.5 billion annual budget. Patient care revenue makes up the lion’s share, or 75 percent. As state appropriations remain flat from year to year, and needs continue to grow, UAMS seeks additional philanthropic support.